Flexible, feature-rich and customizable solution that does more than you expect. Despite it's name, you'll be surprised at the many uses for JReviews which go far beyond reviews! We've put together a powerful and extensive feature set that are unmatched. Our products and support will empower you to build the site you want, whether it's a review site, business directory, product catalog, store locator, classifieds and practically any other application you can imagine. Learn more about the best Joomla directory and reviews component and the best WordPress directory and reviews plugin. 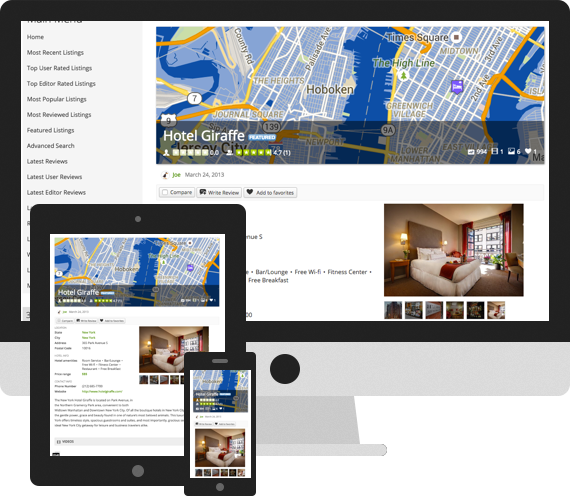 Modules for advanced search, listings, reviews, media, calendar, field options and more. Additional functionality through Add-ons allows: Google Maps integration, selling new listings and upgrades, custom user lists, widgets on external sites, public user profiles, reviews in other components, listing resources, Facebook Apps and more.